A bit like The Matrix, no-one can be told exactly what Gate Of Hell looks like, it is something you have to see for yourself and then try to force your eyes into believing the new reality you will be confronted with. 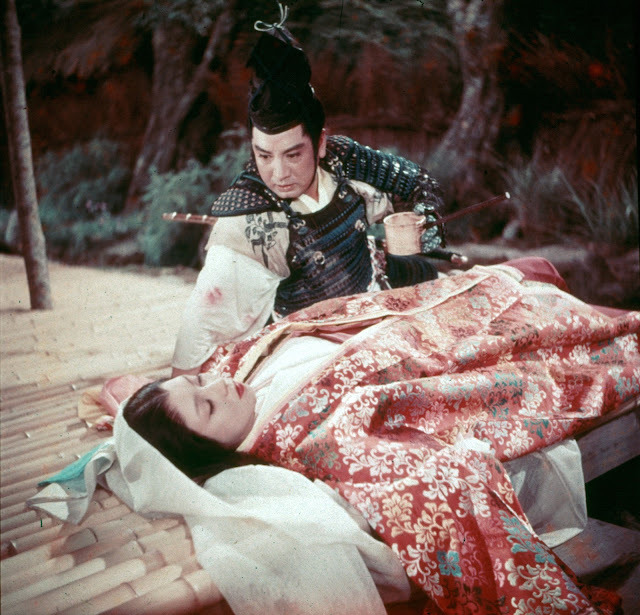 Stills certainly do Teinosuke Kinugasa's film no justice. The colours at work here look like someone has blended technicolour with an acid trip and then forced it inside Joseph's dreamcoat to slow-bake for an hour or two. The film's palette is really, to quote an over-used phrase which is, for once, entirely valid, like nothing you have ever seen before. Silks shimmer vividly from the screen, purples look like they've been painted by the neon artists of Tokyo's towers, the whites are certainly by Daz. The colour of this film is enough to hold your attention from beginning to end alone. Which, in a way, it is required to do. The script, from Teinosuke Kinugasa and Masaichi Nagata lacks panache and is full of exposition. 'I can see you look smitten', someone points out at one point, a typical example of how little the script trusts the director's eye. But then, Kinugasa's direction does little to convince us that he would have done better with greater quality material, or that this is a significant departure from Kan Kikuchi's play, on which Gate Of Hell is based. Meanwhile the technical elements (particularly the sound on some of the sets) are occasionally revealed as deeply flawed. The entirety of Gate Of Hell is remarkable only in how it consistently swings from likeable to mediocre. Lead Kazuo Hasegawa is charming one minute, a wholly unconvincing hero the next. 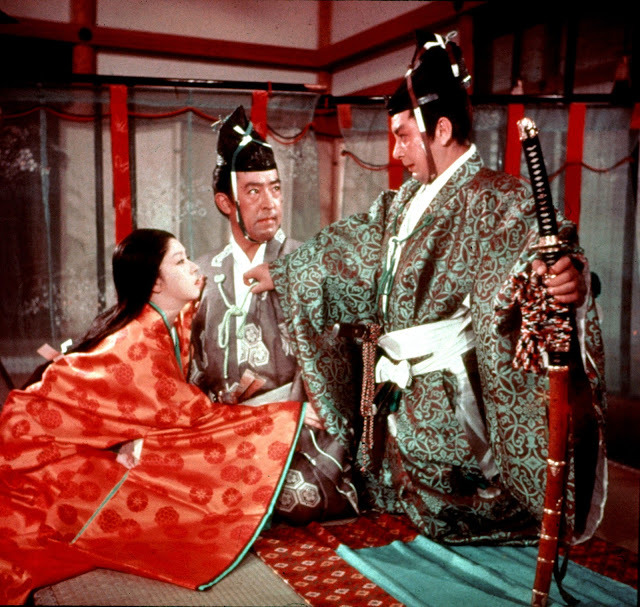 Wronged husband Isao Yamagata is slight and shrew-like for a time, stoney-faced and unsympathetic for even longer. The only actor, indeed, the only element of Kinugasa's film, who is consistent enough to be strong for the whole runtime, is Machiko Kyô, whose Lady Kesa is the ultimate victim in this, pulled into a love triangle by virture of a noble act during the film's opening. It does, ultimately, all come back to Gate Of Hell's look rather than its content, a feat which cinematographer Kôhei Sugiyama should be proud of. Martin Scorsese calls this one of the ten greatest colour achievements of world cinema, an argument which is incredibly easy to justify. Another contemporary director, Christopher Nolan, consistently points out that he is yet to see digital achieve the feats he has seen physical film perform. You suspect that Gate Of Hell could prove a very useful tool to his argument.